Aaron Creasy, 78, retired farmer and lifelong resident of Beach City vicinity, died yesterday afternoon at his home after six months illness. He was a member of the U. B. church at beach City. 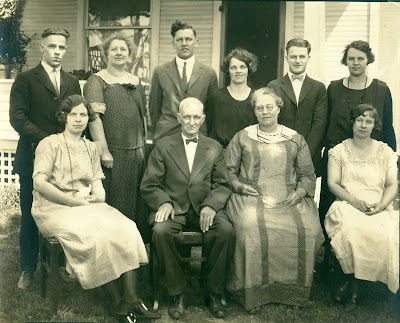 Survivors include his wife, Etta; one son, S. E. Creasy of Route 1, Navarre, who is owner of the Creasy Arms Co.; one sister, Mrs. Lucy Lieser of Concordia, Mo., and one grandson. Funeral services will be conducted at the Adams-Lantzer Funeral Home in Beach City at 2 p.m. Thursday, with the Rev. V. C. Stamets of the Navarre U. B. church, officiating. Burial will be in South Lawn cemetery, Beach City. Friends may call at the funeral parlor after 4 p.m. today. 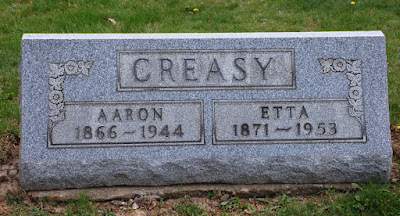 Source: Death Claims Aaron Creasy (New Philadelphia, OH: The Daily Times, 19 July 1944) 8; digital image, Newspapers.com: accessed March 2018. Reuben, who was born in Ohio, moved to Texas sometime between the 1880 and 1900 US Census. He lived in Ballinger, Runnels County, Texas for the 1900, 1920 & 1930 census reports. Those reports tell us he was involved in manufacturing. 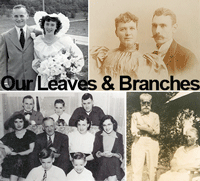 We know of one son, Bruce Creasy, who was born c 1878 in Texas. The following obituary gives us a little more information about his life. This obituary was published in Ohio where his sister lived. I found no obituary in Texas newspapers. R. B. Creasy. Mrs. Caroline Boerngen, of 643 State ave., NE, has received news of the death of her brother, R. B. Creasy, of Ballinger, Texas, June 25. 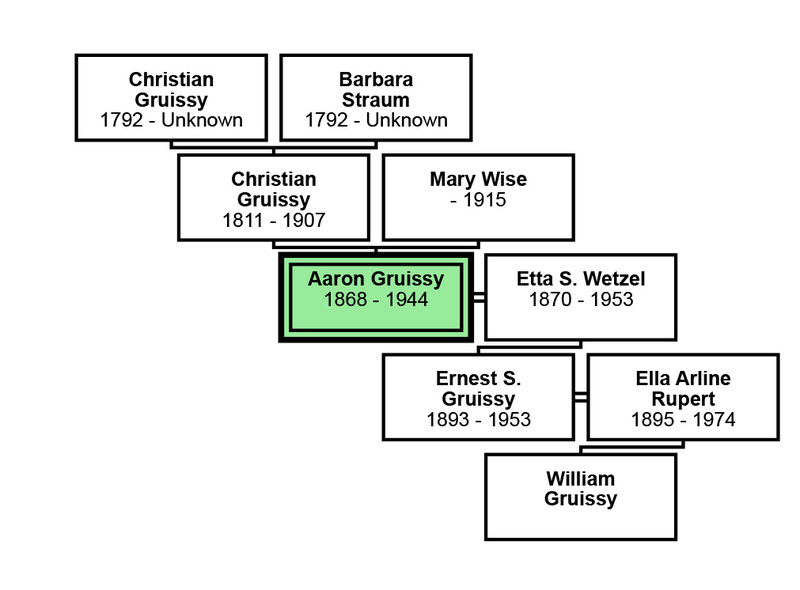 Mr. Creasy also is survived by his widow; a son, Bruce, of Ballinger; another sister, Mrs. Lieser, of Missouri; two brothers Phillip and Aaron, of Beach City; and two grandchildren. 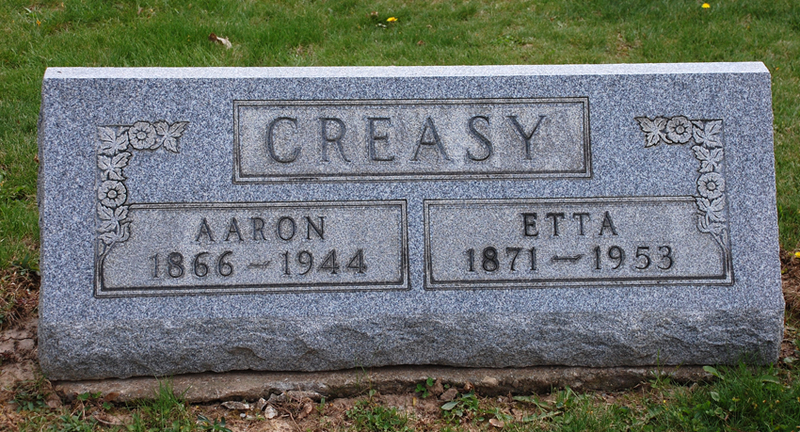 Mr. Creasy formerly lived in this city. He worked at the old Doxie mill and later supervised the Warwick mills. He was a member of the Masonic lodge at Ballinger and was engaged in the manufacture of rotary filing machines of which he was the inventor. He was well known throughout the southwest. 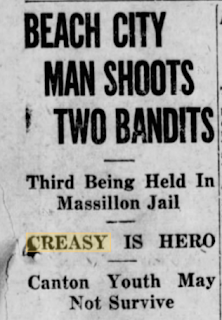 R. B. Creasy (Massillon, OH: The Evening Independent, 5 July 1933) 2; digital image, Newspapers.com: accessed March 2018. 1900 US Census, TS, San Saba; digital image, Ancestry.com. R B Creasy. 1920 US Census, TX, Runnels, Ballinger; digital image, Ancestry.com. R B Creasy. 1930 US Census, TX, Runnels, Ballinger; digital image, Ancestry.com. 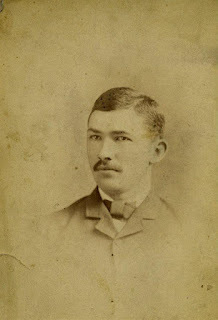 Reuben B Creasy. Stark county authorities today continued questioning a wounded steelworker about the fatal shooting of a 59-year-old gunsmith in a wild gun battle near here Saturday. S. Ernest Creasy, operator of a gun shop on route 21, just north of Navarre, died at 12:10 a.m. Sunday, more than seven hours after exchanging shots with a gunman in his shop. Stark county Coroner E. B. Mozes said Creasy was shot twice in the abdomen. The coroner attributed death to the shots and inter-abdominal hemorrhage. McCray, who was taken to the hospital shortly after 7 p.m. Saturday told Massillon police that he was shot in the side by a hitchhiker. But Chief Sheriff’s Deputy Ray Nunamaker, reached at the hospital this morning and queried about McCray’s story replied, “That’s out. Now he doesn’t know where he was.” Nunamaker said McCary will be booked as soon as he condition permits. The deputies said that they learned that the man had registered as “Jack Reynolds of 836 Maple st., MNassillon” when he purchased the gun. (Massillon’s directory lists no “Jack Reynolds” and addressed on Maple ave., SE only reach as high as 232.) 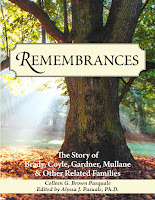 About a half hour later the man returned, just as Creasy and his wife, Ella, were sitting down to the supper table. 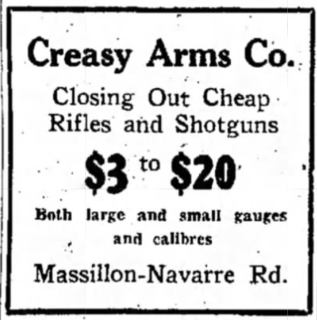 Mrs. Creasy said her husband walked into the adjoining gun shop and she heard him say, “What’s the matter, doesn’t the gun work?” Mrs. Creasy said the man answered, “Sure” and started firing. Creasy told the deputies he ducked behind a stack of ammunition cartons after the first fusillade and grabbed a .45 Colt which he kept behind the counter. The gunsmith fired at his attacker and the man fell to the floor of the shop. Creasy said the man cursed him and climbed to his feet and fired again. Creasy, badly wounded, fired a second sheet but deputies said the slug tore through a gun cabinet against the wall and wasn’t close to the gunman. Mrs. Creasy alarmed by the shots, ran into the shop in time to see the gunman running across the front porch to his car. She said he climbed into a black car and drove south on route 21. An ambulance was summoned from Massillon and Creasy was rushed to the hospital. Deputies said they later found four empty .22 caliber shells on the floor of the gun shop. Two empty shells were found in Creasy’s .45. The officers, however, said they were not sure how many shots were fired by Creasy’s slayer. And they have been unable to find the gun which Creasy sold to the man, and which later was turned on him. Chief Deputy Nunamaker this morning ssaid his men are looking for the missing .22. McCary was questioned by deputies who picked up a police radio broadcast here, after McCary had appeared at the station with a gunshot wound in his side. Desk patrolman Joseph Slinger summoned Capt. C. A. Davenport and Patrolman Clyde Johnson to take McCray, an employee of the Union Drawn Steel division of Republic Steel Corp., to the hospital. Deputies Shuey and Dudzik said McCary denied knowledge of Creasy’s shooting, saying he was wounded by a man he had picked up in his car near the Massillon state hospital. Earlier in the day, McCray told deputies, he drove to Greensburg and brought his sister to Massilon, and then drove her back to Greensburg. While returning to Massillon, according to McCray’s statement, he stopped at a tavern in Donaldsville and drank three shots of whiskey. McCray said he picked up the hitchhiker a short time later while he was driving south on route 21 to a fruit and vegetable stand at the junction of routes 21 and 62. When he approached the fruit stand McCray told the officers, the hitchhiker pulled a gun and ordered him to keep driving down route 21 to route 212, at the Stark-Tuscarawas county line. After turning off route 21 into route 212, McCray said, the hitchhiker ordered him to stop and get out. As he was backing away from the car he was shot, he said. McCary said he then was ordered back into the car and the gunman continued driving on route 212 until he hit a guard rail then he jumped out and fled, McCray told detectives. The wounded man said he then drove his car to police headquarters here. Police said they checked McCary’s car and found it was damaged in the right front end. 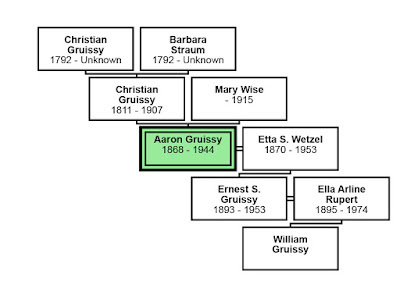 Creasy was a native of Greenville, Tex., who came to Beach City as a boy. 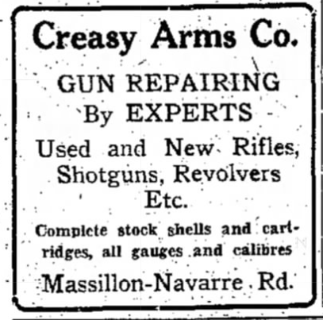 After serving in World War I he opened a gun shop and restaurant in Beach City, relatives said. Creasy moved his business to the present location about 20 years ago. He was a member of the Fohl Memorial Evangelical-United Brethren church in Navarre and was active in church affairs. 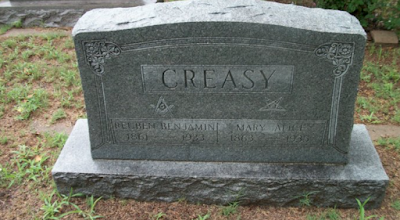 Besides his widow, Creasy is survived by a son, the Rev. William Creasy, pastor at the Sterling, O., charge of the Evangelical United Brethren church. The funeral will be held Tuesday at 2 p.m. in the Fohl Memorial church with the Rev. Herbert L. Smith, pastor, officiating. Interment will be made in South Lawn Cemetery, Beach City. Friends may call at the Hug funeral home, Navarre, after 7 p.m. today. The body will be taken from the funeral home to the church where it will lie in state one hour before the service. Source: Local Man to Face Homicide Charges (Massillon, OH: The Evening Independent, 3 Aug. 1953) 1; digital image, Newspapers.com: accessed March 2018. Ernest owned a gun shop in Beach City, Ohio. My grandmother had told me about a shooting in his store but until recently I could find no verification of that tale. Now I have unearthed two newspaper accounts of shootings there. This is the first. Beach City Man Shoots Two Bandits. Third Being Held in Massillon Jail. Canton Youth May Not Survive. Bulletin. Sheriff Harry Smith, this city was notified by Canton authorities this afternoon that William Zuzeberger, 21, one of the three Canton youths who figured in a robbery and scrape at Beach City last night, confessed to robbing an aged farmer, residing near Strasbrug, Monday evening, taking $5 from their victim. Local authorities were investigating the story this afternoon. Two of a trio of Canton youths who allegedly attempted to hold up C. E. Creasy, expert marksman, in his sporting goods store in Beach City last night, were in Massillon’s City hospital today, and the third was in jail. Jerome Rothermel, 21, was in critical condition with a bullet wound through his lungs. Glen Infield, 18, was shot through the side. Their companion, William Zuzeberger, 21, was jailed when he took the wounded youths to the Massillon hospital. 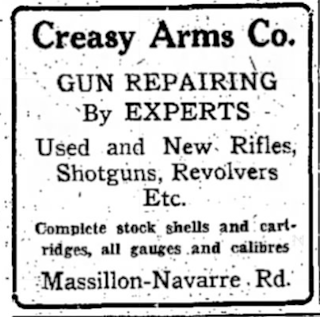 Creasy is the proprietor of the Creasy Arms Company, at Beach City, and is well known over the state for his prowess with shotgun, pistol and rifle. “Stick ‘em up! We mean business,” one of the three said, as they entered Creasy’s store and all drew their revolvers. Creasy reached over the counter, grabbed Zuzeberger around the neck and jerked his head down on the counter, “kayoting” the bandit temporarily. The other two forced Creasy to release Zuzeberger and step back. They looted the cash register and they demanded Creasy’s pocketbook. While reaching for the wallet with one hand, Creasy slipped the other hand under the counter and got a loaded 38-caliber revolver. Zuzeberger had recovered his senses. He saw the covert move and ducked. The others started running as Creasy opened fire. Zuzeberger aided the two into an auto and sped away. Creasy notified Massillon police and then started in pursuit. The three were then taken into custody immediately upon arrival at Massillon City hospital and Creasy’s money was returned. Rothermel and Infield are drivers for a milk company at Canton, according to Sheriff Ed Gibson, Canton and Zuzeberger recently was released from peison after serving a term for robbery. 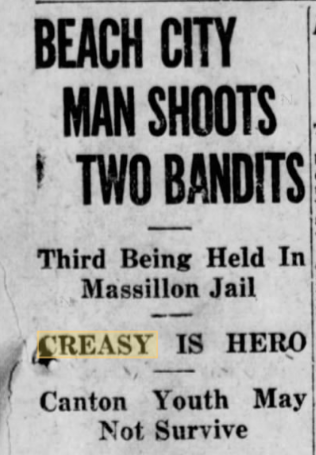 Source: Beach City Man Shoots Two Bandits (New Philadelphia, OH: The Daily Times, 27 Nov 1929) 1; digital image, Newspapers.com: accessed March 2018. 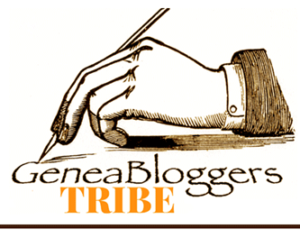 Watch for the blog post about the second shooting.